1. 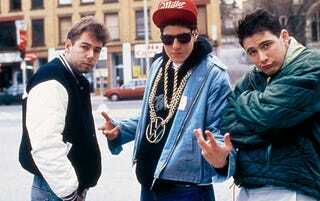 Ad Rock - Still known to let the beat drooooooooooooooopp in his mid-40s. Discovered LL Cool J and got him signed to Def Jam. Has managed to marry both Donovan's daughter and the Bikini Kill singer who got punched out by Courtney Love. Has Silver Surfer tattoo. The King Ad Rock still reigns supreme. 2. MCA - made out with Madonna before it was cool; managed to make being a Buddhist badass; crashed REM's VMA acceptance speech while dressed as Nathaniel Hornblower (below); now rocking it up with Buddha himself in heaven. 3. Mike D. - Oh. You're Mike D.